With just three weeks until Election Day, and the accusations between the two presidential candidates and their supporters increasing to a near-daily frequency, fact-checking is more important than ever. 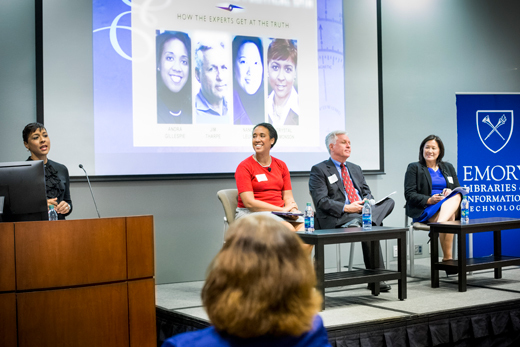 Experts shared their methods and the fact-check websites they trust during a discussion on Thursday, Oct. 13, in the Woodruff Library called “Fact-checking the Political Spin: How the Experts Get at the Truth,” hosted by Emory Libraries. Moderated by Atlanta Business Chronicle broadcast editor and Emory alumna Crystal Edmonson, the panel featured Andra Gillespie, Emory associate professor of political science; Nancy Leung, senior editor of CNN’s Reality Check; and Jim Tharpe, editor of PolitiFact Georgia at the Atlanta Journal-Constitution. PolitiFact is a national fact-checking organization with 18 state partner sites. Staffers research the accuracy of statements made by politicians and rate them on the Truth-o-Meter, from True to False, with the most outrageous falsehoods earning the Pants-on-Fire designation, Tharpe said. Reality Check rates claims as True, True but Misleading, False, or It’s Complicated, Leung said. The team usually performs about 15 checks a night, but that has increased to up to 30-40 checks during the 2016 presidential debates. “We have specialists in national security, medical issues, people who focus on the State Department,” to help check the claims, she said. The demand for fact-checking is growing. Tharpe said with the rapidly increasing number of news websites — both credible and less than credible — generating stories and counter-stories, it can be difficult to discern fact from fiction. “If that sort of disinformation continues to perpetuate, I think fact-checking will be even more important as we go forward,” Tharpe said. In addition, Gillespie said our trust as a country has declined over the last generation and a half. But how do voters know which sources are reliable? Leung said her team uses a variety of sources, including CNN’s own stories, factcheck.org, PolitiFact, AJC, fact-checking websites The Hill and Real Clear Politics, and news articles where sources are cited or linked, so the information can be double-checked. For voters who are doing their own fact-checking and find a source that is unfamiliar, Gillespie suggests they click on the "About" page or read other articles on the site. For those who don’t have time to do the research themselves, panel members recommended consulting a reputable fact-checking website (see sidebar). A source that’s not reliable? The Drudge Report polls, which are neither scientific nor representative of the voting population at large, Gillespie says. With the misrepresentation of facts becoming more common in politics, it’s up to readers and viewers to question the information in front of them. “There is a lot of information being presented,” Gillespie said. “If it seems illogical, if the way it’s gathered or being interpreted seems false, if you have a base of knowledge that you can see they’re misinterpreting a poll,” voters should follow their instincts and fact-check, she said. “I would also say triangulate — get information from as many sources as possible before you take something at face value,” Gillespie added. The event drew students from Emory and other schools, faculty and community members, who found the information valuable. Taylor Smith, a Spelman junior majoring in political science, said her main question prior to the event was: How can we check and make sure that everything the candidates say during the debates is accurate?"